-30~-60 CP to enemies at target. 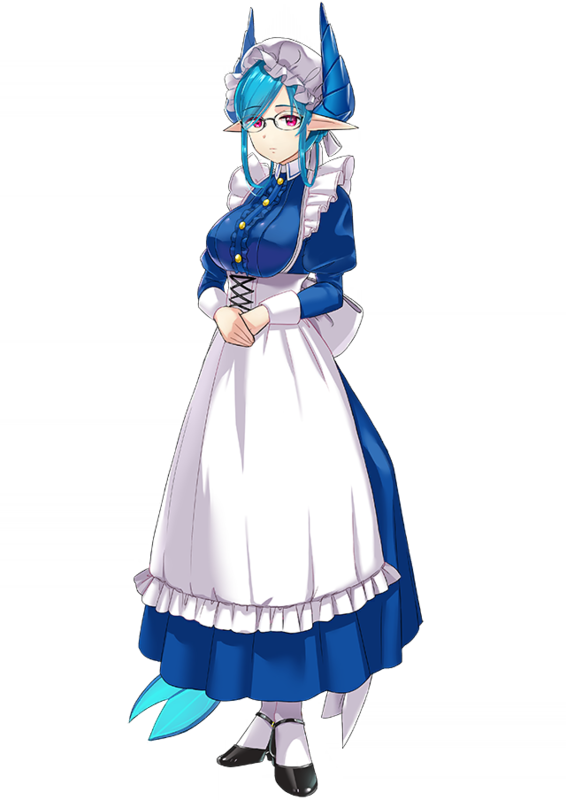 A dragon in maid form who works for the Roppongi Guild. Once queen of a castle back in her home world where she was renowned of her beauty, wealth, and power both in political sway and military might. However, she was never blessed with love, and she wandered away from her territory in seach of it. In the end; she suffered rejection and the mental trauma that comes of such hurt. When she could wander no more, she found herself in Tokyo where she met the Roppongi Guild master whom she came to idolize. She would do absolutely anything for this man she calls Master. She and the butler of the Ikebukuro Guild are sworn enemies, calling each other such harsh names as Codependent Buffoon and Nuclear Landmine. They have a habit of tryingto kill each other every chance they get while insults fly about like curses. A dragon maiden Summon who is an attendant (aka maid) of the Roppongi guild. In her home world she was a queen who ruled from a certain castle in a certain land, possessing looks, wealth, influence, and violence. However, love was the only aspect in which she was not blessed in, and as she departed from her territory to seek a new love, she found only rejection leaving her a lady with a broken heart. At the end of her wanderings she came to Tokyo and met the Roppongi guildmaster, adoring him. If he so willed it, there was nothing she'd hesitate to do, no one she would refuse to take as master and serve. Every time she meets the Ikebukuro guild's butler she would exchange verbal blows of "codependent man" and "nuclear landmine woman" as incompatible mutual enemies before trying to kill each other. The dragon wings Sacred Artifact springing from her back are valuable things. Should there be any treasures in the earth the wings attract them, and with the power of "Requisition" befitting of a queen they grant her wealth. However she has no interest in gold and silver, but since she gave them to the people she loved she was rushed by swarms of gold seekers, cutting at her heart further. Additionally, growing huge wings has made her an object of fear. To top it off, having gigantic wings made it impossible for her to live in her castle, forcing her to live in the cave beneath it with the treasures she cared nothing for. All of the above reasons have caused her to detest her wings. Heavy weaponry are stored within her wings, which she uses in combat. (Ahh~you can't, Melusine! Hasn't it been decided already that I shall not love and live single? Yet, my heart is yelling for love!) May I help you, master? 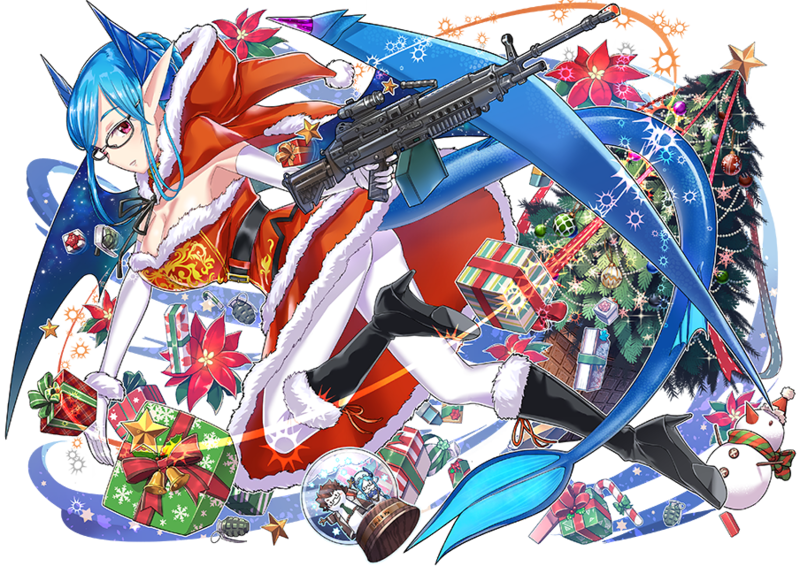 "Melusine joins the Christmas party in Ikebukuro in the stead of her dear master. She mustn't do anything to harm her master's reputation. Melusine tells herself that she will be fine thanks to her perfect manners, but what she had not expected was to take part in a race around Tokyo. With renewed determination, she realizes that her task will likely be much harder than she had thought. It is, however, all to honor her master's trust, and also to begin a new start. To show devotion to one who was born lacking something is the price of the System which maintains her home world of Tir Na Nog, that of changeling children." She has come to the Ikebukuro Christmas party as a representative of her beloved master. Sullying her master's face cannot be allowed. See things through to the end, Melusine. It is alright, my manners are perfect...she says to herself as she arrived, but what awaited her was a big race rally around Tokyo. "This may be a little, no a lot more difficult than I expected," she thinks to herself as she renews her determination. She does so to answer her master's trust in her and to take a new step forward for herself. She shows strong dedication to children who were born but could not have anything. That is rooted in the compensation for the child replacements done to maintain her home world of Tir na Nog. Wearing the dress, just a little, lets my feelings return to the past. I feel that I can deliver my thoughts now......I like you. Please excuse me. Her Role is "Sovereign" and her Rule is "Requisition." Melusine is based on the serpentine water spirit of the same name in European mythology and folklore depicted as a mermaid, often with wings and two tails. The folklore revolving Melusine is often characterized as her marrying a nobleman only after he makes an oath to give her privacy in her bath; which ultimately ends up being broken and Melusine leaving the nobleman. 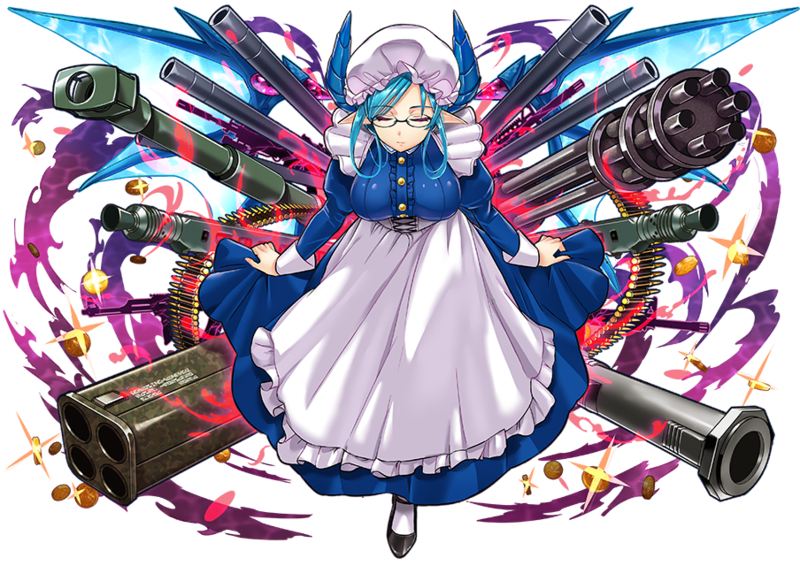 Character uses GUNS but none of her versions are SNIPE Units! Why? You know I really like this character, she's neat. Especially after being able to read a bit more into her backstory and manner thanks to the translation. And any unit with movement ability is a godsend for the larger grids. This page was last edited on 14 April 2019, at 01:49.